Wauseon High School student Olivia Clark has been selected to dance in the annual Macy’s Thanksgiving Day parade. The Macy’s Thanksgiving Day Parade will get a boost this year from an aspiring local talent. 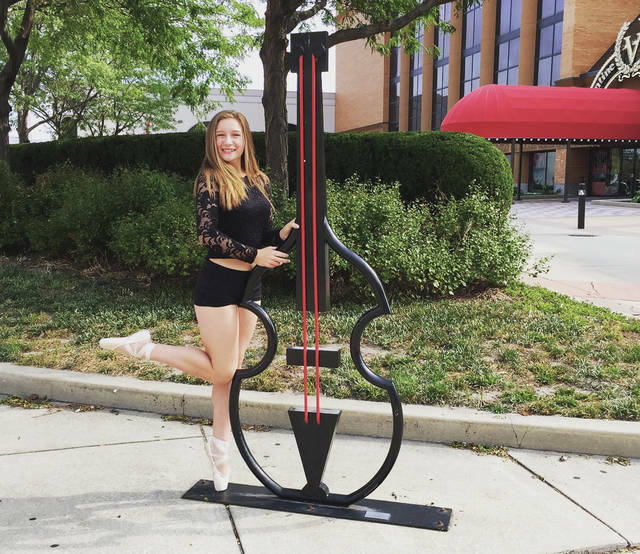 Currently a member of the WHS marching band and theater troupe, 15-year-old Olivia said she’s fired up about the opportunity, and hopes it will be a springboard for her dream career as a professional dancer. “I’m very excited. I’m ready to take this on,” she said. Now in her 13th year of dancing, Olivia has been steeped in the art form since first taking the floor at age two at In Step Dance Center in Columbus. She won her first competition there at six before moving on to Kim Hohman’s Danceworks in Van Wert, then to Dance Expressions in Maumee after her family moved to Wauseon. Dancing and musical theater are in her blood. Her father, Don Clark, is the WHS band director; her mother, Jamie Clark, is the Color Guard director for the Falcon Marching Band at Bowling Green State University. Olivia said over the years she’s watched some of her mother’s former students perform in the Macy’s parade. The audition tape for a spot with MGAMB was demanding. Olivia had to dance to hip hop, contemporary, lyrical, and jazz music, then demonstrate marching to a specific tempo, all in a three- to five-minute video that was posted to YouTube. “I was so nervous. It was one of those things where I couldn’t mess up, and I wanted to get everything right,” she said. She did three takes of each performance, and, with help from her father, combined the best to create the video. A professional dancer makes the final selections after reviewing audition tapes. While the dance team can hold up to 10 people each year, this year only seven applicants from across the country were chosen. Olivia and her fellow dancers will automatically receive invitations to join MGAMB in the Thanksgiving Day parade again next year, an honor they can accept until graduating from high school. But the honor doesn’t come cheap. The cost to appear, not including airfare, is $1,800 which includes hotel accommodations, tickets to a Broadway musical, and Macy’s souvenirs. A GoFundMe account for Olivia’s expenses has been established by her mother at www.gofundme.com. Olivia is also pursuing corporate sponsorship, and private donations may be delivered to Don Clark’s band office at the high school. Olivia will arrive in the Big Apple the Saturday prior to Thanksgiving to begin practice, and will attend a dinner and dance held after the parade for all participants. She’s also planning to look at The American Musical and Dramatic Academy, New York University, and Marymount Manhattan College as potential performing arts colleges to attend . https://www.fcnews.org/wp-content/uploads/sites/45/2018/11/web1_Olivia-Clark-1.jpgWauseon High School student Olivia Clark has been selected to dance in the annual Macy’s Thanksgiving Day parade.